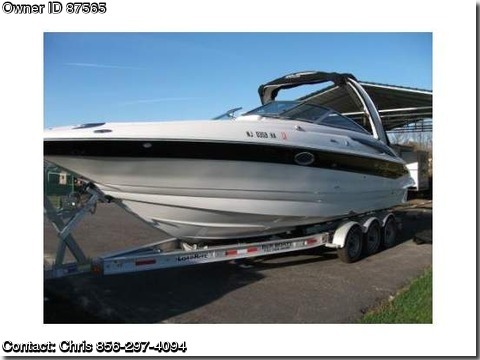 2008 Crownline 300 LS,Practically brand new boat with only 57 hours on T350 Mag Bravo III. Always stored under boat port..no bottom paint. must sell with pending divorce. Make offer. asking $81,000 compare at over $130,000 new. All options on this boat!! Stored in boatport at home and trailered to water. Over $130,000 to buy new. AM/FM/CD with dash remote and transom remote. Cockpit wet bar with stainless steel refrig. 6 Stainless steel pop up cleats. Front and rear bimini top with radar arch. Anchor locker with anchor roller. Twin 350 Mag Bravo III. 600 hp. 57 hours on engines with only fresh water use. Extended swim platform with boarding ladder. Rear facing seating on transom for water activities. Aluminum tri-axle Load Rite trailer included.